The ForexKore is a forex expert advisor. 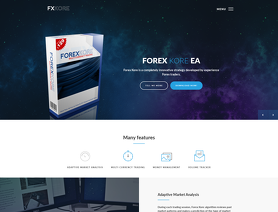 The Forex Kore automated forex trading software for the MetaTrader platform has been forward tested on a live account by ForexPeaceArmy. The ForexKore.com forex robot works with any MT4 Brokers. No support. EA fails with plenty errors. Support does not exist, I have three open tickets on their website, none that have a response. The EA traded fine for a while, but has now stopped completely and the Experts tab is full of errors. These errors have been going for days, and strangely enough started just after the 60 day money back option had expired. Look's like these guys sell pirate/old version of other people's EA's. From my own experience they just won't reply to your email's once they realise they aren't gonna get more money out of you. Bought 2 days ago, Ran on all 9 pairs using default settings on a $700 account with 200 to 1 leverage, banked $300 IN 2 DAYS. BEWARE DRAWDOWN %40. Just an update. After trading with this ea for over a month, I’ve noticed that it’s only using 10% of the margin. I updated the risk settings by increasing them from .04 to .06 and the ea has beets returning about 2.5% per day since the change with still not one losing day. Oct 16, 2018 - 4 Stars I’ve been running this ea for over a month on my demo account and have just started it live. I’ve been averaging 1.2% return a day consistently through both live and demo. It is a type of martingale system, which worries me, but it doesn’t work exactly that way. What I see it doing is if you have a basket of trades that are losing, it will add another trade in the same direction with a higher lot size, and then adjust the t/p point for all so that they all close at the same point, but the larger lot size will cover all of the previous losing trades plus some on the winning side. These larger lot sizes are incremental increases, not the doubling of a true martingale. Even still, it is winning at an 80% rate with 0 losing days. Now I’ve also changed the settings on it to suit me, and suggest others do the same. Standard settings have the ea trading 9 currency pairs. What I did is eliminated 3 of those pairs to lessen my exposure on the USD and EUR. I had noticed that a big swing in either would affect my account too much for my liking. Of the nine pairs, all of them are majors, but I eliminated EUR/JPY, USD/CHF, AND AUD/USD. These are the least traded of the nine, and evened out my exposure a little. To counter this in the settings, I raised the minimum lot size by .01 across all of the others, and changed the max trades in each basket to 20 from 15. Therefore, I making more trades with bigger lots on fewer currencies, but my exposure is close to the same as having all 9 currencies trading. So my current settings are $30K of equity with 200:1 of margin trading on FXChoice. Now for these amounts, i’m running my settings at .04 lots, by turning manual lots to true and changing the minimum lot size. And as equity grows, raising it by .01 for every $10k of growth. Now you may wonder why i’ve only given this 4 stars. The reason is that support is non existent. I’ve tried to contact them and have neve gotten a reply. I suppose if I had an ea that was working this well, I would probably be off enjoying my profits. But regardless, I did have questions in the beginning that I ended up figuring out myself. One big thing is if you set up a chart incorrectly, you must delete that chart. If you don’t, even if you delete the ea off of it, it will still run. That may also be true of other ea’s. As well, it seemed to install itself onto open charts that I didn’t put the ea on. Not totally sure about that, it may have been something I did. So if you are going to run it, set it up carefully, with only the charts you need being open. This EA preformed amazingly and i was very excited with its potental. Unfortunately it carshed hard by continuisly buying a stock on freefall and cost the account every penny.